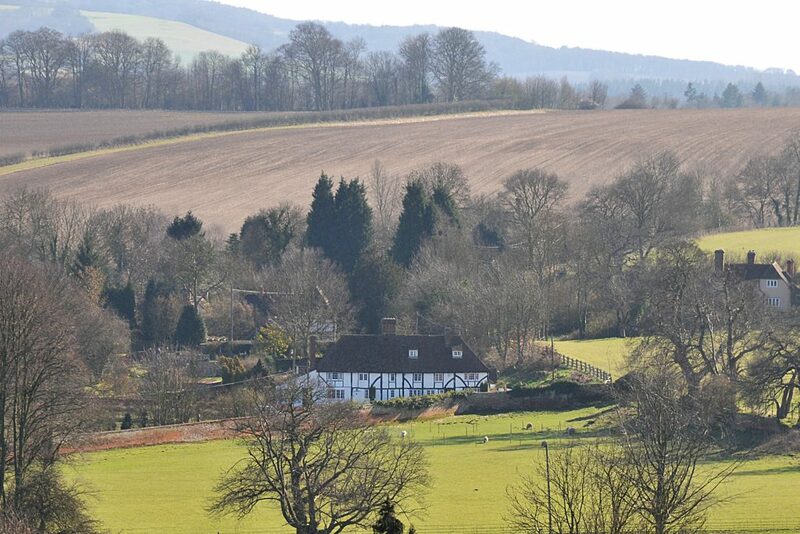 Two charming, peaceful cottages within part of an historic 15th century Tudor Kentish Hall house, listed Grade II by English Heritage. In immaculate condition, tastefully modernised, well equipped, with all modern facilities. They have been owned and cared for by Helen for the past 34 years; up until 2002 this was shared with her late husband, Prof. Reg Kirwan. Situated on a quiet country lane which is the North Downs Way National Trail and Pilgrims’ Way to Canterbury: nestling in the Kent Downs ‘Area of Outstanding Natural Beauty’ Overlooking Chilham Castle Park, surrounded by chalk down-lands, orchards of apple and hops, lakes and water meadows; a perfect location for walking. Only about ten minutes walk to Godmersham Park (often visited by Jane Austen) and the ancient forest, Kings’ Wood, c. 2,000 acres (900 ha.) where King Henry VIII hunted deer, famous for its carpets of bluebells in spring but stunningly beautiful all year as are other nearby walks in the Stour valley, Wye and Crundale Downs. 1/3 of a mile from the Tudor village of Chilham, its famous square surrounded by 15C timber framed houses and fine church sometimes used as film sets with two pubs, train station, bus stop and Post Office. An excellent local farm shop supplies groceries, fruit, vegetables and general provisions. Easy access to many of Kent’s attractions, it’s picturesque, historic villages, famous castles and gardens, it’s coast and nature reserves. Canterbury 6 miles, Dover 25 miles, Channel Tunnel Terminal 20 miles. Mistletoe (2+): one bedroom with twin beds: ideal for 2 but there is a third single bed on a landing area. but a double sofa bed in the living room downstairs can accommodate up to 2 more guests.